Hey. Psst! Pal. Come over here for a minute will you. Can you do something for me please? Can you keep a secret? Yes? You can? Wow! That's good to know. So can I and the Director: Felix E. Feist; with the Actors: Lee J. Cobb, Jane Wyatt, and John Dall. But they can only do this in 1950, and for about 81 minutes. Alright. So let me get this straight. Howard Frazer (Harlan Warde) leaves his rich wife, Lois (Jane Wyatt). Drive's to the airport. Check's in his luggage. Returns back home again. 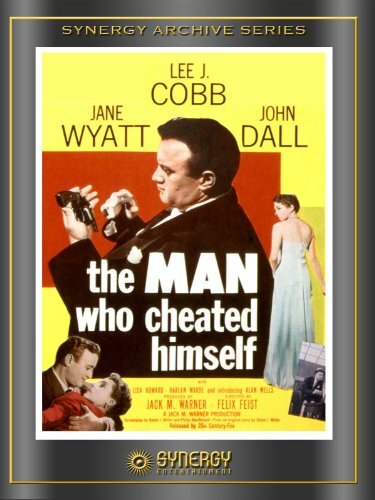 Only for Lois to then shoot him dead in front of her lover eyes -- Lieutenant Ed Cullen (Lee J. Cobb) -- because she suspects that he was going to kill her beforehand. OK. I know that this very bold series of events does sound very strange when I put it like that. But I tell you something, folks, you'd never guess what Ed does next? No. He doesn't do his best impression of Humphrey Bogart, silly! Instead, he quickly dumps Howard's body by the airport, before he starts to investigate this crime as if he was none the wiser. Yeah. I'm not kidding. Both Ed and his younger brother, Andy (John Dall), go from the people who found Howard's corpse, to Lois, to the crime lab, and attempts to piece together this devilish deed one clue at a time. Furthermore, once Andy gets hitched to his girlfriend, Janet (Lisa Howard), the station's forensics expert informs them that the weapon which was used to kill Howard; has been used once again in a drug-store hold-up. Still, that's most probably why what next transpires takes a nose dive when two law-men have to travel to the Italian quarter. As a son is defended by his mother - a brother turns against his own brother - the guilty party hastily does a runner - and trust me, folks, this film ends on one hell of a bummer. Now if you were a fly on the wall, eavesdropping on me watching 'The Man Who Cheated Himself', I'm nigh on positive you will hear me yelp such things as: 'Oh, No! ', 'You're having me on? ', 'Can he do that? ', 'What'll he do now? ', 'Doesn't San Francisco look very nice back in the day! ', plus quite a few swear words denoting shock and amazement. Well, that is what this film is you know. Shocking and amazing. No. Not in the production department of course. As per usual for movies made in this era, a lot of the camera angles and set-designs appear rather dated compared to today's high standards. What I am referring to instead, dear reader, is everything else to do with this classic film-noir. Honestly. The story is a suspenseful one. All the characters are very of their time. Plus I've got to admit, I myself got so sucked-up by the arc of this tale, that it left me wondering why the hell they don't make more movies like this nowadays. Hey! I'm not jerking you chicken, pal. All the way thought this flick I was on the very edge of my seat, just wondering what the f*ck was going to happen next! Was Ed going to tell his brother what was what? Will Lois come clean or do a runner? And what was Andy going to do when he found out what really was going on? Oh, bugger! I'm yelping again, aren't I? Even though I've watched 'The Man Who Cheated Himself' already. I know, just to stunt my mindset for a bit, let's have some filmic-facts now, shall we? (1) 'Twentieth Century-Fox' first released this production on the same day that the Irish poet, James Stephens, passed away -- the 26th of December, 1950. (2) Although most of this movie was shot at 'General Service Studios', Las Palmas, California, by in large most of the external scenes were shot on location throughout the American state of San Francisco. This includes: Lafayette Park, Pacific Heights; 287 Union Street; and Fort Point, Presidio, by the Golden Gate National Recreation Area. (3) Loosely translated, this film was entitled 'Murder in Panic' in Sweden; 'By an Evil Woman' in Brazil; and 'The Man Who Deceived Himself' in Italy. (4) Not only did the actress who played Janet Cullen in this flick, Lisa Howard, marry the director of this flick, Felix E. Feist, but regrettably, she also committed suicide two months prior to him dying of cancer. (5) This was the only theatrical production ever produced by the 'Jack M. Warner' Production Company. (6) Lee J. Cobb's first film role was as an un-credited 'Roadwork Foreman' in the 1934 thriller, 'Vanishing Shadow'. (7) One of the screenwriters on this film, Philip MacDonald, also penned the popular television series, 'The Virginian'. Whilst the other screenwriter assigned to this film, Seton I. Miller, wrote the dialogue for the original 1932 'Scarface' crime-thriller, starring Paul Muni. (3) During his time as a director, Felix E. Feist directed such television shows as 'Voyage to the Bottom of the Sea', 'The Outer Limits', 'Adventures in Paradise', 'Bonanza', plus many-many more I can't be bothered to mention. Hey! Before I scoot off to reviewer-land, folks, I just want to tell you something else about 'The Man Who Cheated Himself' that I haven't mentioned yet. The actors. Well, without beating around the bush, the two standouts for me would have to be Lee J. Cobb and John Dall. No word of a lie, both of these great actors really stake their ground in a very no nonsense manner. With Lee playing the hard yet gruff cop doing whatever he has to do to protect himself and his beaux. Whilst John is like a fresh young pup who stumbles onto something that I'm sure he wished he hadn't. So, all in all, I'd say that this film was a really-really great film. Very of it's time -- sure -- but with a compelling and evolving storyline that I wish they'd made more of nowadays.